Lucky Glauber (ラッキー・グローバー) is one of the members of the American Sports Team in The King of Fighters '94. 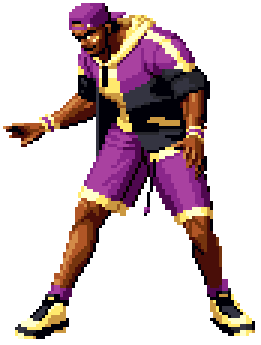 Lucky is a karate champion who is also a former professional basketball player who is asked by his friend, Heavy D!, to form a team with him in The King of Fighters '94 tournament. Aside from his desire to help bolster his friend's confidence, Lucky joins the tournament to test his fighting ability. In their ending, he says he'll continue street fighting. He, along with the rest of the members of the American Sports Team, have a running gag in the history of KOF which involves their invitations being stolen by other participants. Similarly, in the backstory of NeoGeo Battle Coliseum, Shermie defeats Lucky and takes his invitation to the tournament. This page was last edited on 18 January 2009, at 16:47.